The title does not lie. "Herman van Veen: All of Him" is the name of the one-man show that opened on Broadway last night, and all of Herman van Veen is what you get. You get his singing, his mime, his dancing, his jokes, his politics, his fiddle playing. And it doesn't take too long to discover that this is way too much of a poor thing. 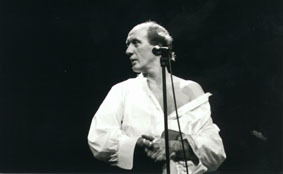 According to the Playbill handed out at the Ambassador Theater, the Dutch-born Mr. Van Veen is "one of Europe's most renowned musical theater performers." A spindly man of 37 whose long sad face and bald dome are fringed by long blond curls, he looks like Len Cariou in the final stages of "Sweeney Todd". He's just about as cheery. He sings of suicide and the mental asylum, of lonely and shattered lives, of transactions with homosexual prostitutes. Comic relief, which is scant, comes in the form of Danny Kay-like sketches featuring authoritarian orchestra conductors and multilingual doubletalk. This performer successfully simulates Mr.Kaye in one worthwhile way: he does good work for UNICEF in private life. That's scant compensation, however, for an audience that must endure Mr. Van Veen's mithless mugging. As a singer, he sounds like Charles Aznavour's understudy; as a mime, he's about four levels below Bill Irwin. His songs, by a variety of authors and here outfitted with English lyrics by Christopher Adler, are alternately in the Jacques Brel and Yves Montand modes. They tend to sound the same and are not enlivened by either Michel Lafaille's leaden direction or the disconsolate playing of a three-man on-stage combo. Along the way, Mr. Van Veen does champion some worthy cause. He's in favor of peace and the preservation of baby-seals; he's against unemployment. He quotes one of his own children in making a strong plea for togetherness. But the dour, maudlin tone of this incessant preaching becomes grating after a while. One is terribly grateful that the United States Constitution forbids Mr. Van Veen from seeking public office in New York. The show also offers a dim semblance of performance art. Philip Glass' name is dropped, and there's a lot of hokey business involving the minimal set (a chain-link fence and hanging moon), loud apocalyptic sound effects, and the slow dropping of the house curtain. Late in the evening, the star spits - and I do mean spits - on the first few rows of spectators and takes to banging on the piano with his rear end. At that point Herman van Veen ceases to be merely what one might call Renaissance mediocrity: he has achieved the stature of a world-class boor.